Platooners will give us once again a Hollywood set and a movie themed design, only this time rather than a soap opera like theme, we have an action movie that is being filmed. The stars are cute and almost alien-like creatures which are placed in main roles, colored in yellow, red or green. They are armed to the teeth, sporting machine guns, grenades, Gatling guns and RPGs, and they seem ready to kill. The location is deep inside the jungle, meaning that you have appropriate graphics in the background. The other symbols are mostly with Platooners dog tags, combat knives, binoculars or first-aid kits, though some playing cards are also shown. ELK Studios doesn’t disappoint here, not when it comes to graphics at least. ELK gives us in Platooners a system with connecting paylines, 178 in total, for a game area of 5×4 reels. They’ve used it in other slots of theirs as well, so it’s not new. A win of up to 250,000 coins is possible while you play this game, as are bonus games, scatter symbols, wilds or Action Spins. There is no requirement to bet on the 178 lines individually. You just pick the total bet, out of the dozen or so values that are listed. The smallest one is $0.20, while the biggest reaches $100. In Platooners, the simplest feature that you can have is a Wild Logo, which you get to use as a substitute in situations where this is appropriate. The scatter symbol is more elaborate, showing some kind of Snake Idol in its image. When you land 3+ of these Snakes, the game will trigger a feature called Platooners vs Snakes of Fortune. Additional scatters give you more attacks from the Platooners on the snakes. These Platooner characters also have random features that they can trigger. The Green Platooner will have Rockets for example, covering the 1st and 3rd reels with identical symbols. From the Red Platooner, you get the Grenades feature, with wilds added to the last three reels. As for the Yellow Platooner, his Bullets feature gives you a payline with a 5-symbol combo on it. Platooners has the awesome graphics that we’re used to seeing from ELK, along with unique features that we’ve also found in most of their releases in the past. 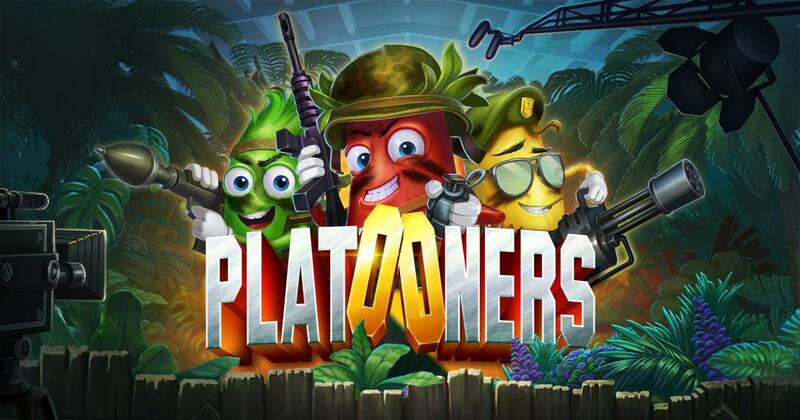 Try of out a demo version of Platooners.